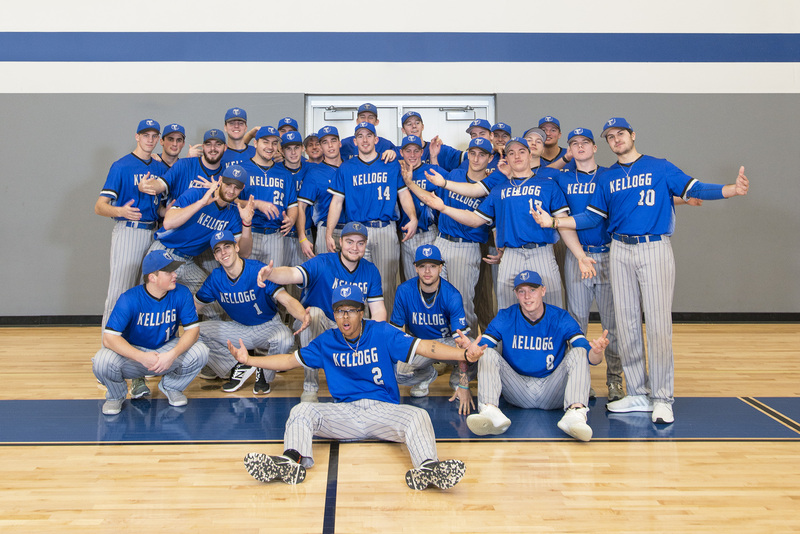 Kellogg Community College’s baseball team is ranked seventh in the nation in the 2019 National Junior College Athletic Association Division II Baseball Preseason Rankings, which were released Tuesday. It’s the second national preseason ranking honor bestowed on the Bruins in as many months. The team was ranked 10th in the nation in Collegiate Baseball Newspaper’s NJCAA poll released in December. The Bruins are one of just two teams in Michigan and the only team in the Michigan Community College Athletic Association Western Conference to appear on the latest ranked list, which includes the top 20 teams in the division in the nation. Lansing Community College, which is part of the MCCAA Eastern Conference, appears in 20th place. The ranking is calculated according to the combined rankings of regional NJCAA coaches along with insights from those who make up the NJCAA DII Baseball Committee. Eric Laskovy, KCC’s head baseball coach and a physical education professor at the College, said it’s an honor to receive the national attention. KCC’s baseball team has established a continuing tradition of excellence on and off the field under Coach Laskovy, who last season finished his 19th year of coaching baseball at KCC and 12th as the head coach. The team has qualified for the NJCAA D2 World Series six times since 1999, and has claimed 11 Michigan Community College Athletic Association Conference Championships, including nine since 2005. The Bruins ended the spring 2018 season as the runner-up in the NJCAA Region XII Baseball Tournament, and finished the season as MCCAA Western Conference and State champions with an overall record of 45-8 and a conference record of 22-1. Additionally, last season nine KCC baseball players were awarded postseason athletic awards from the MCCAA, and 14 earned postseason academic awards from the MCCAA. Sophomore Logan Briggs, of Traverse City, was honored as the College’s male Scholar-Athlete of the Year, and Head Coach Laskovy was named MCCAA Coach of the Year – his eighth win of the award. The Spring 2019 season kicked off with the first official day of practice on Jan. 10. The Bruins will open their season with the team’s annual spring trip to Eunice, Louisiana, in February, where they’ll play the first three games of their schedule against Louisiana State University Eunice — the team ranked first in the nation in both the latest NJCAA poll and the Collegiate Baseball poll released in December. For more information about KCC baseball, including a full season schedule, a roster and official team and individual photos for use by fans and the media, visit www.kellogg.edu/baseball.